I'm just going to go ahead and start this review by saying, "Go get this book and read it." Now that is out of the way, let's get on with the review. Doni Faber recommended this book to me and lent me her copy. It was so good I read it in a day. I think most avid readers enjoy reading not only for the story, but for the writing itself. Whether the word craft is beautiful or masterful, or written just so that it invokes our own memories to surface— making the reading not only a new adventure, but a way to live inside the book through our own memories. 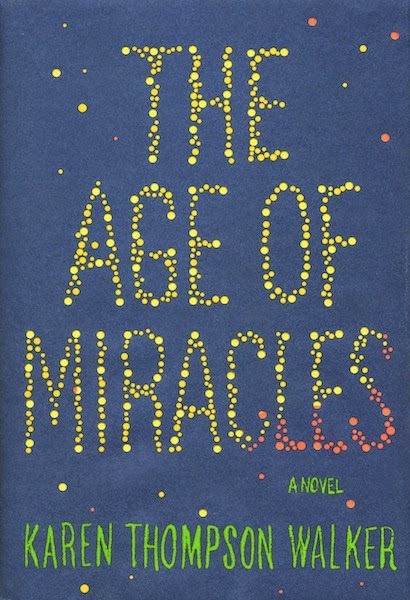 The Age of Miracles is written in both those ways making it a real literary treat. We follow 11 year old Julia through the awkward transition that each child makes from child to teen. The literal age of miracles, where body parts blossom and grow over night and weaknesses and talents begin to become defining. Julia is one of those sixth graders that does not stand out. She is neither popular, or unpopular. She sits in the middle range that is unnoticed and unbothered. It's a comfortable place. But then the Slowing happens. For reasons unknown, the Earth's rotation has begun to slow. The days and nights grow longer, gravity changes, weather changes... people change. Crops failed to grow, animals began to die, the future of the world was in question. Some said that the Slowing begins to affect the way people think and the choices they make. Maybe that's true, or maybe the people were already changing, and it's all just a coincidence. This book is not exactly a happy book. (but still so good, people) There is so much sadness and anguish and worry. After I closed it's pages, I laid in bed just thinking. Thinking about my own life, the future of my daughter, how much I loved the people close to me. It's beautiful, haunting, and maybe even a warning. This isn't a book where a superhero comes in and saves the day. This is a book about a world that is changing, dying, and the story of the people living and surviving through it. And even though this story is about Julia and her life and experiences, in a way, it becomes the story of Earth. The people who live here. The animals that inhabit the earth. The way the grass smells. If there is intelligent life out there in the cosmos, what would we tell them about our planet? And if we were all gone, the earth a barren, lifeless place, what legacy would be left behind to show that we were here? This book is smart and well thought out in a way that makes you feel like everything Walker wrote about could actually happen. I don't know enough about the Earth's magnetic fields, etc to know if the way Walker wrote it in the book would actually happen if the circumstances were similar, but that's the part you just have to accept as the fiction. I think I was a lot like Julia in terms of living in the middle ground on the social scale. So many of the things that Julia said and did were so relatable it made me remember parts of middle school that I had all but forgotten by now. One of the things that bothered me a little bit was the age that Walker chose for Julia and her peers. I felt like the things they were doing and the way they were acting wasn't age appropriate. I kept forgetting they were only 11. They should have been closer to 14 or 15 in my mind. Also, since I'm a Mormon myself, I have to laugh a little bit at the portrayal of Mormons within the story. Vague enough to possibly be an accurate representation, but also off enough that it was funny for me to read.